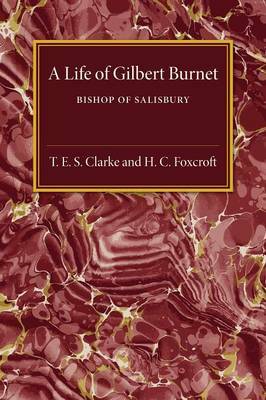 Author(s) Clarke, T. E. S.; Foxcroft, H. C.; Firth, C. H.
Originally published in 1907, this book contains a biography of the historian and clergyman Gilbert Burnet, Bishop of Salisbury. The book is divided into two parts, focussing first on Burnet's early life and career in Scotland and then on his rise and fall and rise again under the Stuart monarchs. The language used is accessible, and the authors express the hope that 'this picture of a varied career, and a vivacious personality, may attract the general reader, as well as the historical student'. This book will be of value to anyone with an interest in the history of religion in England or the life of Burnet.